We woke up at our overnight lodging at 4am so we could get ready for our 5am start. We had a charter with the famous Capt. Kirk Kirkland to fish for Alligator Gar. I mentioned that I would also like to catch some Smallmouth Buffalo so Capt. Kirk picked a spot where we could fish for Smallmouth Buffalo while waiting for a gar bite. An hour later, we arrived at the dam downstream Lake Livingston launching the boat into an already warm morning. At 6:30am, the lake was full of live with many baitfish fleeing hungry predators pushing the bait around. The water immediately next to shore was literally boiling with topwater action. We had our specific targets, so we ignored these distractions and head for a back eddy to set up lines for the gar. Capt. Kirk fish with baitrunner reels, some very strong Penn and Shakespeare rods and a set of 4 bite alarms. On his boat was a remote receiver to keep track of all 4 alarms. 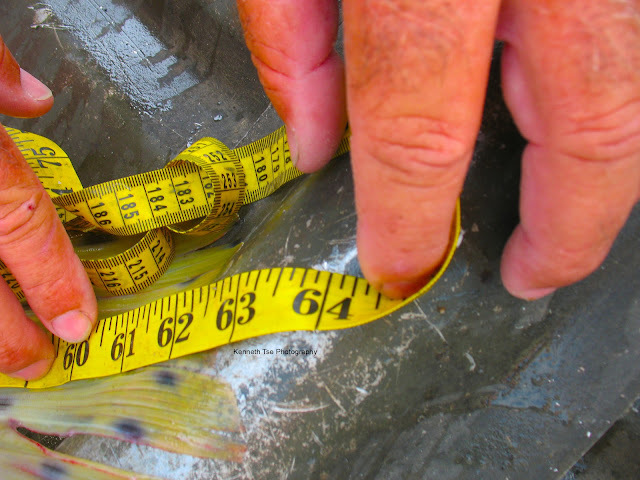 Prior to booking this charter, I looked at some DIY fishing for Alligator Gar. However, the amount of gear and size of gear involved were just not in my arsenal. It would cost too much to get rigged up anyways. Capt. Kirk is usually full booked a year in advance, but we got lucky that someone had cancelled on the weekend and we got a spot. I wanted to get hands on setting rigs and putting out lines. As much as this was a charter, it was a chance to learn how to prepare everything so perhaps my cousin and I can do it on our own in the future. First, a steak of carp or buffalo was cut. Putting the steak on a 3/0 treble hook, tied to 180lb wire attached to 100lb mono leader and 80lb mainline with a large float, we either cast or dropped the rig at various distances from shore. This early in the morning, the gar came shallower to feed so we set the lines quite close to shore. 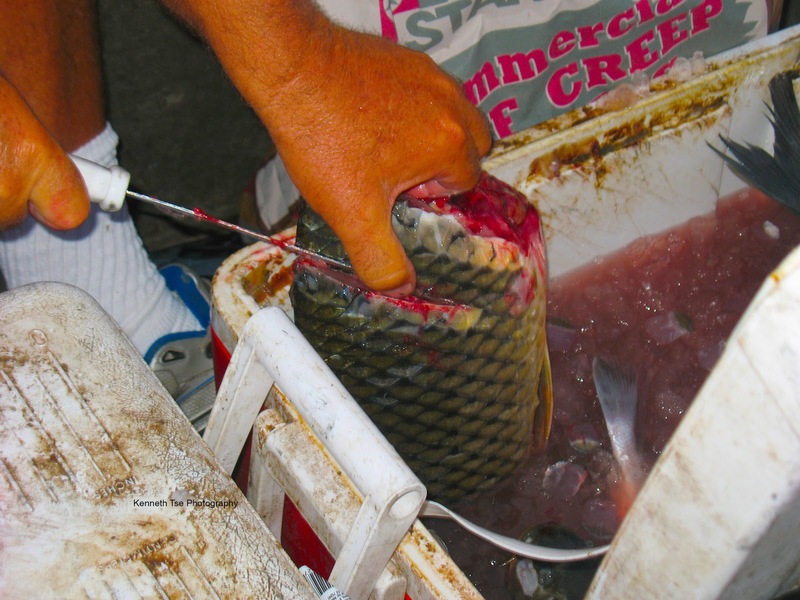 With all 4 lines set up, we chummed the water with some creep feed and proceeded to fish for carp and buffalo. The buffalo had an extremely soft bite. We missed quite a few before I finally hooked a Smallmouth Buffalo. Unfortunately, while trying to cradle the fish to bring it aboard for a picture, the hook simply came out! The buffalo bite was very slow and we needed some fresh bait. The gar rods were quiet. After an hour, we decided to pull in the lines and cast netted some bait in a backwater area. I was surprised to find there was a very good population of Black Buffalo under Lake Livingston dam! This is probably one of the best area in the world to find some. We netted quite a few for gar bait. In addition, we also had White Bass, Yellow Bass, White Crappie, Common Carp, Smallmouth Buffalo, Largemouth Bass, Blue Catfish, Bluegill Sunfish and Striped Mullet in the cast net. With a day's worth of bait collected, we headed downstream of the bridge to fish a promising spot. We set up one line on the west bank while 3 lines were set on the east bank. Johnny was next to hook up when something took him for a ride! 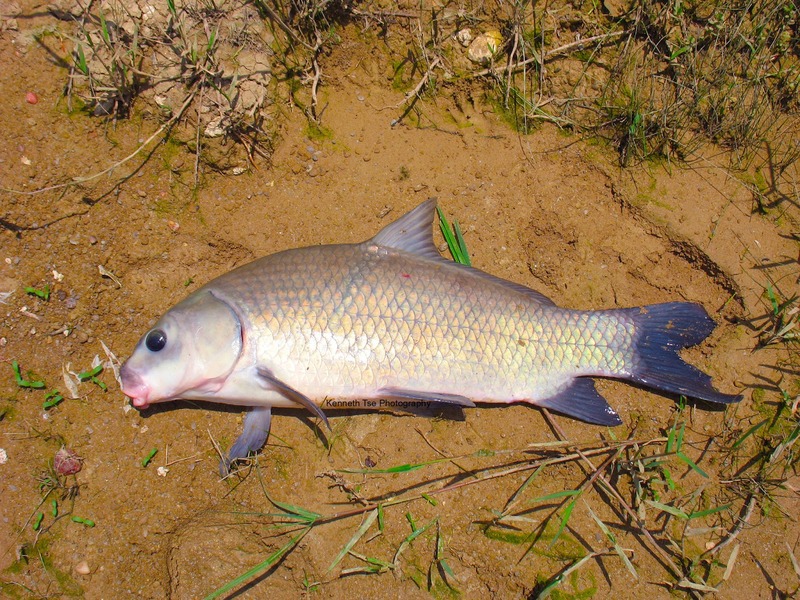 We thought it might be a big Common Carp or a big Smallmouth Buffalo when a Grass Carp surfaced. 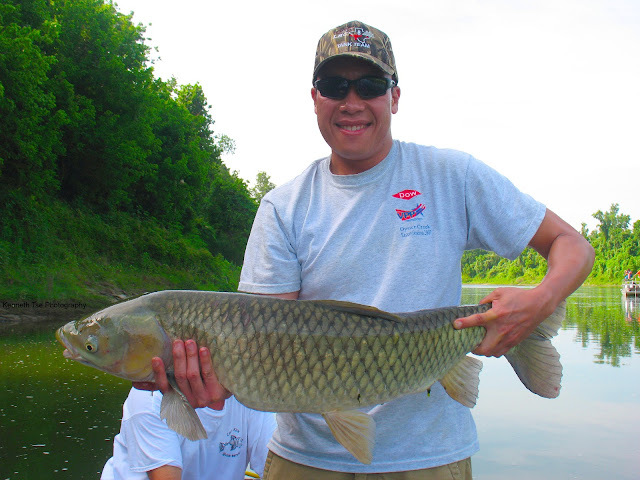 My cousin had never caught a Grass Carp and he was very happy with this 20lb+ Grassie! Capt. Kirk and Johnny started catching some Smallmouth Buffalo but I just couldn't get the timing right to set the hook on these Smallmouth Buffalo. Johnny then caught his first Common Carp that was about 3lb. It was just the perfect bait, so we reset a couple of lines with the fresh carp, and a line with the head of a buffalo, and the last line with a whole mullet. The gar lines were very quiet for the first hour. Suddenly, like the flip of a light switch, we started to get a few grab and drop. At long last, the line with the buffalo head finally went off steadily and it kept going. I was first up so I grabbed the rod and let the fish take line on the baitrunner. We started following the fish around. You have to wait for the fish to take the bait deep enough before setting the hook...and this wait may often last 10 minutes. While following the fish, it appeared that the fish had ran into a stump on bottom and the line was stuck. Capt. Kirk then did something scary...cutting the line. 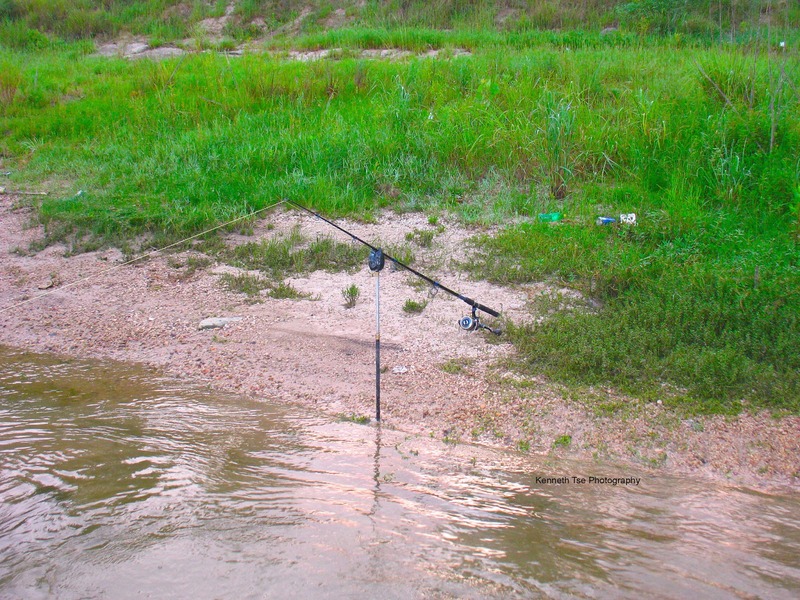 He reassured that he knew exactly what to do, and without missing a beat, he took another rod to snagged the line again, clearing the stump, and reconnected the two ends of the braid. Wow! We probably followed this fish for about 5 minutes when Capt. Kirk asked if I was ready. I gave him the OK and he told me to reel tight and set hard. When I reeled tight, I could feel this heavy weight on the other end and I gave it a hard sweeping set. Just to be sure, I set the hook 2 more times and the fish woke up. Woah! Fishing some pretty heavy drag, the fish dug down and I fought to stay in the boat LOL. Okay...there wasn't a point at all during the fight where I feared being pulled over...but these fish certainly knew how to throw their weight around. Suddenly, the fish shot for the surface and gave a great jump! For these larger fish, they certainly has less stamina than I thought, and the fish was quickly subdued to boat side. If you think they were completely done though, you do not know these gar. While we tried to rope this fish, it jumped once beside the boat, tried to run under the boat once (everyone thought I was getting pulled in when I tried to follow the fish around the bow and put the rod in the water to clear the line off the side LOL), and it even gator rolled a few times. After 2-3 attempts, we finally had the fish roped and Capt. Kirk asked us to clear the deck. It was 63" long and 24" girth. That would make the Alligator Gar about 40lbs...but it looks massive on me. I was ecstatic with that fish. Now it was Johnny's turn. We reset all the rods with fresh bait. Not long later, the gar turned on. At one point, there were 3 rods that went off at the same time, but unfortunately, all three dropped the bait after a minute of running. We also had one good run on a rod that dropped the bait after 5 minutes. It was getting a bit frustrating that the fish were picking up and dropping bait before we could get a hookset. We also had a fish ran a bait into a stump and got the line stuck on bottom. An hour later, the rods completely went quiet. Capt. Kirk decided to try the back eddy by the dam again. We sent out all 4 rods. With the sun high in the sky at 12pm, the baits were set in deeper water. The midday heat seemed to have turned on the buffalo and we were getting lots of hits and misses. As usual, Kirk and Johnny were cleaning house on Smallmouth Buffalo and some Black Buffalo, but I just could not get a hook into these fish! Finally, I had a hook into a Smallmouth Buffalo and managed to keep it on. This time, I simply swung the fish onto shore and jumped onto the muddy bank to claim my catch. I was fishing very hard for a Black Buffalo but none would jump on the hook for me. Then suddenly, with about an hour left of our trip, we heard that steady long beeping from one of the gar rod. We drove the boat over to the rod and Johnny had it in hand. We followed the fish into the deeper water in front of the dam before the fish turned around and settled in this slower current for a while before heading off again. This was the sign that the fish had stopped to turn the bait to take it deeper, so this is the time to set the hook. My cousin reeled the line tight, felt the weight and set the hook hard. The fish loaded the rod for a second when the line went slack! Come on!!! When the line was reeled in, the wire leader was coiled around twice. Capt. 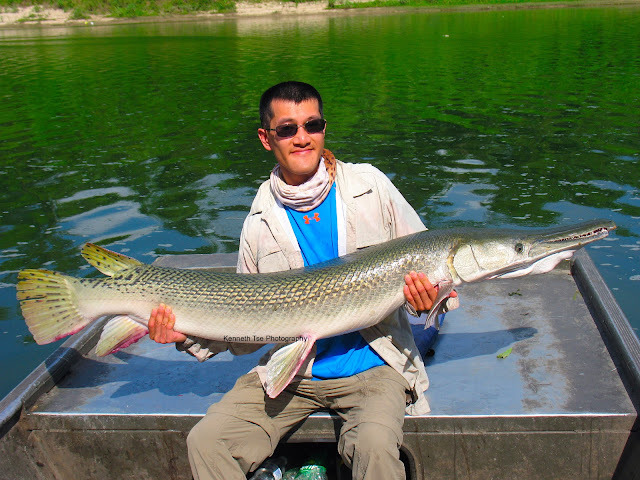 Kirk figured that the gar had wrapped the line around its snout and that's why the hook simply couldn't set. We were a bit deflated since this was already a tough day with very few solid bites. Just under 30 minutes left to our day, we set the rods again and hoped for the Hail Mary. Unfortunately, it never came for Johnny. I felt terrible. Johnny, finding out that my birthday was next week, offered to paid for the entire charter as a birthday gift. 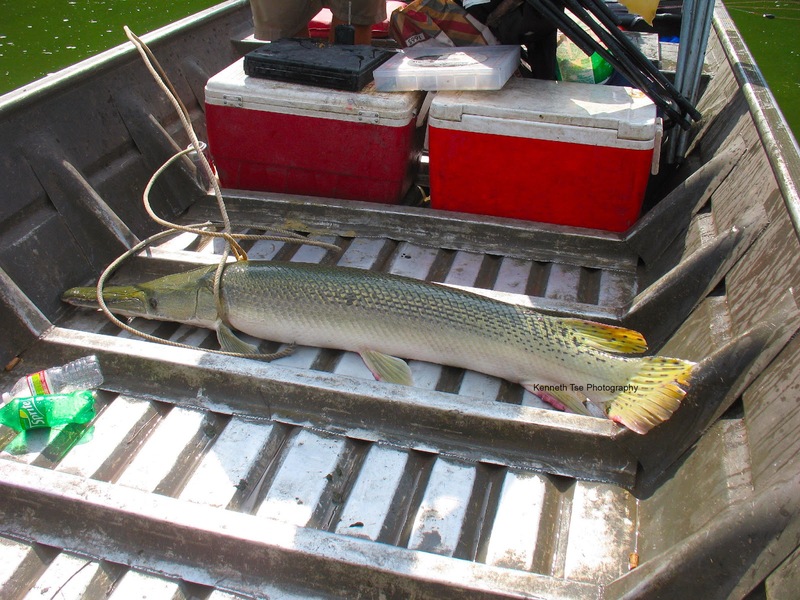 It was not a cheap charter ($550 + $60/night lodging) and I really wanted him to land an Alligator Gar. Capt. Kirk said we had a tough day and offered to give us a discount on our next charter should we decide to try it again. Hopefully, I can return next time to split another charter and give Johnny his chance at an Alligator Gar. We returned to the lodge to take a shower before making the 2 hour drive home. By the time we arrived in Houston, it was already 7pm. 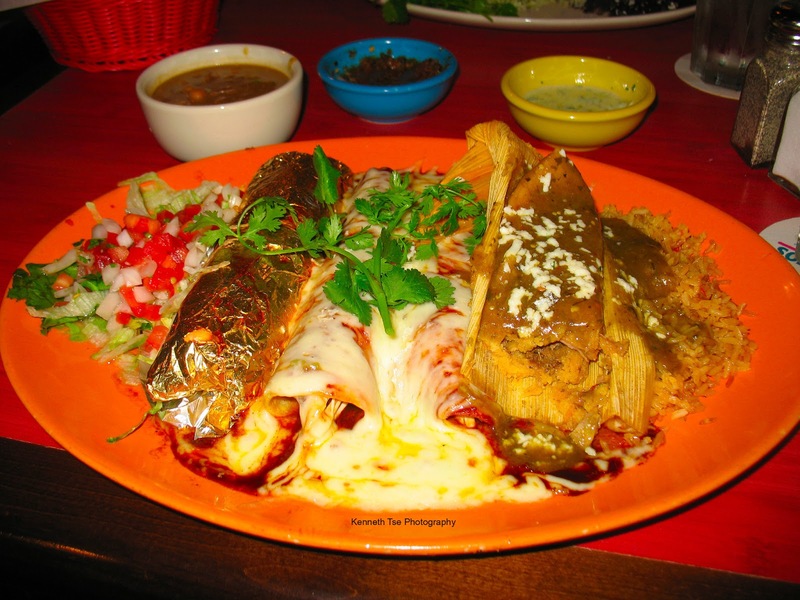 We picked a great Tex-Mex place for dinner and it certainly was tasty. The portions were huge even with my disproportional appetite...and I couldn't finish it all!